The Duke of Danby is matchmaking again. No matter what his overbearing duke of a grandfather wants, Thomas Goddard has no intention of marrying a high-born lady. He’s the son of Danby’s by-blow, for heaven’s sake, and no gentleman! When yet another letter—complete with yet another marriage license—arrives, Thomas does as any reasonable man would do. He rips the thing to shreds, tosses it over the cliffs, and curses Danby’s name. Regrettably, his shouted curse startles the very lady his grandfather intends for him to marry. Because of her wayward brother’s numerous and repeated indiscretions, Lady Matilda Bexley-Smythe has just endured yet another Season on the receiving end of both salacious gossip and censorious glances. She’s had all of London Society she can stand, so she intends to find a husband who is unconcerned about her brother’s ne’er-do-well behavior. She settles on the seemingly perfect choice—a gentleman unswayed by gossip—but when Mattie finds herself being carried home in a handsome stranger’s arms, her whole world unravels at the seams. Just looking down at Danby’s red wax seal upon the letter was more than enough to cause Thomas Goddard’s blood to bubble up beneath his skin. Perhaps that was why, when the damned thing had arrived, he’d set the letter aside and attempted to forget about it for three full days. Yet despite his best efforts, every time he’d returned to his office covered in sweat and dust and grime from his work with the horses, the letter had seemed to grow in stature until it could quite nearly mock him. Thomas’s feelings toward the duke were mixed, at best. Danby hadn’t known that Thomas and his brother and sister—or even their father, for that matter—had even existed until around Christmas time a year and a half ago. Considering that Father was the duke’s by-blow, the lot of them really shouldn’t have any expectations of the man. Whether they’d had expectations or not, Danby had made it possible for Abby to marry a gentleman. He had even granted her a dowry—something which Father would have found impossible to provide with his butler’s wages. If aiding Abby hadn’t been enough, Danby had secured Robert a position as a butler in the employ of Lord Upton Grey. If all of that hadn’t been outside of enough, the duke had settled a handsome sum on both Robert and Thomas that nearly matched the dowry he’d granted Abby. It was more than any of them had ever allowed themselves to dream, being the legitimate offspring of an illegitimate father. If that were all the duke had done for them, then Thomas would have no complaints about his newfound grandfather. Not any real complaints, at least. Regrettably, Danby seemed to have ulterior motives behind his generosity. Namely, he expected both brothers to marry like Abby had done. Well, that wasn’t the truth of it. Marriage, in and of itself, was not such a horrible prospect. He doubted Robert would be opposed to taking a wife at some point in the future, and Thomas certainly wasn’t. He had every hope to someday find a lovely woman of a similar social status and begin his own family, much as his parents had done many years ago. The problem, however, lay with the fact that Danby expected both brothers to marry so far above their station as to be laughable. Last Christmas, when the duke had summoned all his children and grandchildren to Danby Castle, he’d had marriage licenses in hand for both Goddard brothers and some of their still unmarried cousins. He’d even had the brides and grooms he’d selected in residence at the castle as well! Danby’s attempts at matchmaking seemed to know no bounds. The young lady he’d selected as Thomas’s intended was a viscount’s daughter, for God’s sake. He couldn’t marry a viscount’s daughter. She was a lady. She ought to marry a peer, or at least a son of a peer—someone who was a gentleman. Thomas, despite his overly rapid rise in station thanks to his supposedly well-meaning grandfather, would never be a gentleman. So he had taken to his horse and rode off as fast as the beast could travel. Two weeks later, the marriage license had arrived in the post along with a curt letter detailing how the marriage contract would be drawn up once Thomas took it upon himself to meet the lady, speak to the viscount, and do what he’d been bidden to do. The letter and the marriage license had both perished a hasty death in Thomas’s hearth. He’d hoped that that would be the end of Danby’s ill-advised attempts at matchmaking—or at least the last of Danby’s attempts at making a match for Thomas, even if he didn’t cease his attempts for his high-born grandchildren. Apparently, he was a fool to have hoped for such a thing. In the spring, he had been expecting some correspondence from Danby about the stables and the duke’s expectations for the running of them. As such, when a letter arrived and Thomas saw the red wax seal, he’d broken it without a second thought. An eligible match now, was he? He’d thought being of high birth was requisite to eligibility, at least according to those of the beau monde. And what did Danby know of his honor? True, Thomas could provide for a wife, though perhaps not in such a lavish style as a baronet’s daughter was accustomed. Nevertheless, whoever he took to wife would not want for any necessities in life. Danby’s settlement, combined with the now-thriving horse breeding venture, had seen to that in equal parts. But a moderate income did not a gentleman make. There had been no correspondence about the stables enclosed with the missive…only the brief letter, the marriage license, and a London address for Sir Jasper Finchley, where Thomas was to call upon the certain-to-be-lovely Miss Letitia Finchley. Thomas had placed each and every piece of that letter and marriage license in his waste receptacle, and Marcus, one of the lads working for him, had seen it disposed of properly. This letter, though? He had not been expecting any correspondence from Danby. Christmas was still nearly half the year away, so the duke’s annual summons wasn’t due to arrive for many months. It had become abundantly clear that Danby wanted nothing whatsoever to do with the actual running of the horse breeding business—he’d left that entirely to Thomas—so it surely wasn’t anything to do with the stables. There was only one thing which might be found inside, should Thomas dare to break the red seal. The three days since its arrival had done nothing to assuage his dread about what he would undoubtedly uncover folded neatly within. Yet delaying would not change what was sure to be inside. There was nothing for it. He had to open the damned letter and be done with it. When he’d finished with his day’s work and made certain the stable boys were properly seeing to the horses’ care, Thomas put on his coat and beaver hat, picked up the sealed missive, and left his office. The air was brisk, drawing the salty scent of the ocean over the cliffs. It felt invigorating after a long day’s labor, even if he did shiver against the cold of it. He started off walking, allowing his long legs to stretch out in great strides. Sitting behind a desk was something he doubted he would ever enjoy. Thank goodness his secretary Lindley handled much of that sort of work for him. That allowed him to spend as much time as possible in the stables. The walk felt almost as good as the sea air filling his lungs. He waved at acquaintances as he passed them, speaking briefly with Mr. Fortescue about the mare he’d just purchased, then politely declining an invitation for tea with Sir Julian and Lady Purnell. Before long he’d arrived at the limestone cliffs he had most enjoyed since his arrival in Scarborough. One bit of jagged rock in particular looked out over the vast ocean, its point almost like the bow of a ship. Thomas often found himself here on a quiet, lonely evening. It always proved a good place for thinking about the future and what he wanted for his life. When he arrived today, however, he did not take his customary seat with his legs dangling precariously over the edge of the rock, listening to the sound of the waves crashing into the rocks below him. Instead, he remained standing and broke the bloody, blood-red seal. As he’d expected, the marriage license was the first thing he saw. The word Lady, printed neatly upon the parchment, was the next, preceding some long, high-born name or another. Thomas ripped the bits of parchment into shreds, tossing them out into the air to flutter down into the ocean below. “Damnation, Danby!” Thomas couldn’t have stopped the curse rolling from his tongue if he’d tried—which, admittedly, he hadn’t. Before he could even think of what it might mean, he was racing in the direction of the screams, his heart at a complete standstill. So far, the sound of the waves crashing into the cliffs had proven to be just as peaceful and soothing as Bea had promised it would be. The fortnight Mattie had spent in North Yorkshire, well away from the ton and its censorious eyes had done a world of good for her peace of mind. Sir Lester Hammond’s attention didn’t hurt either—particularly since he seemed thoroughly unaware of her brother Percy and all of his various exploits. She allowed herself to smile, just thinking about how blissfully unaware her suitor seemed to be. The foibles and scandals of the beau monde didn’t seem to have any effect upon him in the slightest. One day when he’d taken her for a walk through town, she’d told him that her brother had a rather unsavory reputation. “Does he?” he’d said in response, just before turning the topic of conversation to the book he was reading at the moment. Sir Lester had only begun to call upon her more frequently after her revelation, and taking on her more and more adventurous outings. 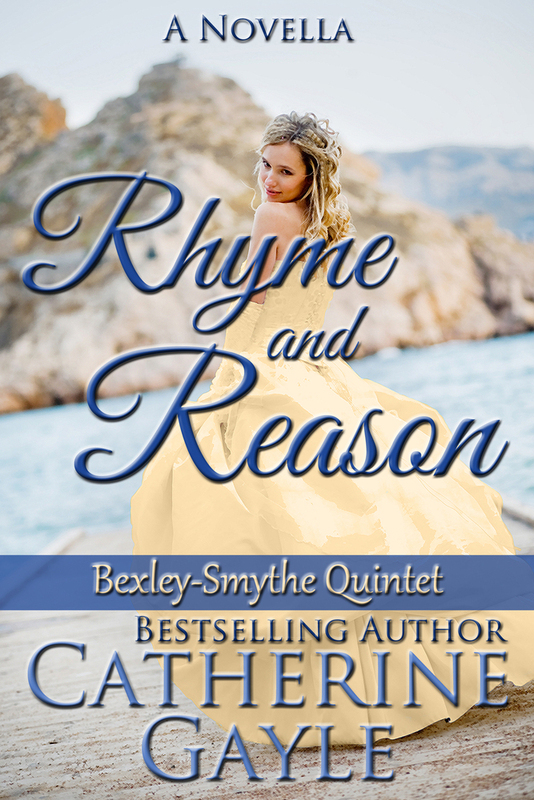 There was something very daring and exciting about him, and she found herself inordinately attracted to a gentleman who could have such a different reaction to anyone else in Town upon when realization of who she was. She could only hope he remained undeterred long enough to offer for her. What chance would she have of making a match otherwise? Mattie breathed in the fresh scent of the salty air, her eyes squeezed closed against the brightness of the sun. She pulled her pelisse closer to her body and hugged her arms tight over her chest for warmth. Summer did not feel quite like summer here in the northern counties, not like it did at home in Hampshire, but she couldn’t really complain. After the tumultuous Season Lady Matilda Bexley-Smythe had just endured, a crisp, summer wind was hardly worth worrying over. “I promise I’ll survive, Lizzie. There’s no need to fear for your position on account of me. Let’s keep walking, shall we?” The maid had made mistake after mistake since the family had arrived for their holiday. Mattie couldn’t worry over Lizzie’s position, however. She had far too many worries of her own vying for space within her mind. She had been expecting Sir Lester to call upon her this afternoon, but he’d sent a note saying an unexpected appointment had come up. Her concern over whether the unexpected appointment might have anything to do with Percy had made it near impossible to take in a breath. Not that there was any real reason she should expect Percy would have had anything to do with it—not here in North Yorkshire, while he was off doing whatever he might be doing somewhere in the southern counties. But that fear seemed to be ever-present, threatening to destroy any chance Sir Lester might form an attachment to her. She’d had to leave the house, to get out of doors where the air could wash over her, or else she might have gone mad from wondering. “Of course, milady. As you say.” Though the maid gave her a sharp nod, her eyes were filled with disquietude. She hefted the parasol up again so it blocked the sun and all its delightful warmth from Mattie’s face, and trudged on with heavy, determined steps. The Season before last hadn’t been so bad. The ton had forgotten about Percy and his shameless behavior that year, largely due to her sister Georgie’s adventure in a gas balloon. A bit of scandal from Georgie and her friends being named in the betting book at White’s hadn’t hurt things, either. But while those things ought to have ostracized the Bexley-Smythe sisters worse than ever before, it had had the opposite effect. They had been the toast of the Town for just a little while. Then for the rest of the Season, the beau monde hadn’t paid much attention to the still-unmarried Bexley-Smythe sisters because Georgie had married Monty. The connection he brought to them—the respectability which came attached to his position as the Earl of Montague—had been more than enough to diminish whatever pall was cast over them due to their brother’s indiscretions. But after a year had passed by, and particularly since Percy’s ne’er-do-well ways had only compounded and become better known amongst those of a certain set, the effects of Monty’s association had dimmed. It would have been different, of course, if Georgie could have come to Town for the Season. But as she was rather indisposed with Monty’s potential heir filling her belly, she had remained behind at his principal seat in Surrey. And Monty, try though he might to be the doting brother-in-law for Mattie and the other Bexley-Smythe sisters, had spent the entire Season distracted to a fault from being away from Georgie at such a time. Monty’s distraction was rather heartening, though it didn’t really help Mattie and Freddie much. Thank goodness Edie still has not had her come out. The youngest sister was blissfully spared the worst of the ton’s censure. Monty’s younger brother, Joshua Loring, had attempted on a few occasions to fill in where Monty had neglected to see after them, but Mr. Loring wasn’t the most upstanding of all gentlemen to grace a London ballroom either. He wasn’t as bad as Percy by any stretch of the imagination, but neither was he a saint. At every event they’d attended, the number of which dwindled as the Season wore on, Freddie and Mattie had been shunted to the sides of the ballrooms and bustled to the edges of the drawing rooms as heated whispers and pointed glances from behind fans passed in their direction. Beatrice Emery, Baron Teasdale’s eldest daughter and Mattie’s dearest friend since they’d attended finishing school together, had been their one saving grace through the entire drubbing otherwise known as the London Season. Even when Bea’s name was bandied about in the same manner as theirs were, due to her unwavering friendship, she had refused to let it deter her. At one point, Lord Teasdale had threatened to cut off Bea’s pin money if she didn’t disassociate herself from the Bexley-Smythes, but his daughter never cowed to his threats. After a strange afternoon when no higher personage than the Duke of Danby had called upon the baron, with Percy in tow, he had finally given it up as a lost cause. And now, Mattie was spending her summer with Lord Teasdale and his family at the spa in Scarborough. I hope they’ll understand. The time for regrets was long past, however. Mattie was well ensconced in North Yorkshire, and Freddie, Edie, and Mama had traveled to Surrey with Monty to be with Georgie for her lying in. They had been right. So she’d come. And now, here she was. The limestone cliffs angled down toward the water at a steep slope. “Let’s go a little closer to the edge, shall we?” Mattie ignored Lizzie’s sounds of protest and made for the cliffs. How often in one’s life could one see such a sight? She had every intention of experiencing every bit of freedom this time away from Percy and the scandal perpetually following in his wake would allow. Heaven only knew what was in store for them all in the not-too-distant future. After walking right up to the very edge, Mattie strained her neck and looked down just in time to see a giant wave crash against the rocks beneath her. The spray from the water flew up into the air, so high she felt like she could reach her hand down and touch it. She’d always been fairly sure-footed, so she paid the maid’s complaints little heed. There was truly something very freeing about standing above the vast expanse of water in such a way. Still, Mattie turned her head to look back, a smile upon her face she was powerless to stop. “Heaven help me if I do,” she said on a laugh. Then she saw the sheer terror etched into every line of Lizzie’s face. The girl must be petrified of heights. Or maybe it was the water that scared her. Either way, she had remained quite a good distance behind. Mattie immediately regretted her jest. Lizzie blanched further, her already pale face turning such a stark shade of white it was a wonder she could have any blood in her body, her fingers so tight around the parasol’s handle she was liable to break it in two. It wasn’t like Mattie to make light of another’s concerns. Gracious, but all this business with Percy had started to change her, and not in a good way. “I’m so sorry, Lizzie.” She turned around fully so she could return to the frightened maid, leaving the ocean at her back. The curse that ripped through the air startled Mattie so much she jumped. Her half-boot slipped against the limestone. She felt herself falling before her mind caught up and recognized what was happening, and a scream which might have been her own cut through the subdued sounds of water crashing into rock. Mattie’s nose and forehead slapped against the rock beneath her even as the weight of her body pulled her backward.